Tides sits at the water's edge in Mount Pleasant, and the residents who are fortunate enough to own a home there are mesmerized every day by the changing currents of the mighty Wando River. From those windows, it is possible to see the past, present and even a glimpse into the future. At night, the traditional homes of the historic district are bathed in the colors of the sunset as the very modern Arthur Ravenel Bridge spans into the future. Charleston's past as a bustling seaport is reflected in the enormous freighters that forge their way up the Wando. Inside, life at Tides could not be more idyllic. "I'm an insider," Peggy Trenker confided. "I live in Tides, I love Tides and I want to share my passion." ...almost 80 acres of marsh front, Tides boasts "a magnificent amenities center"
As an experienced real estate agent, Trenker knows what to look for, particularly when purchasing waterfront property. 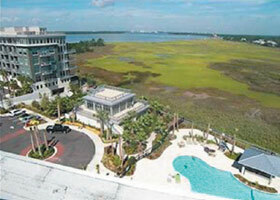 Tides is built over more than 750 concrete pilings extending 60 feet into the ground for stability. "It's such a unique building as far as construction is concerned," she explained, adding that "it is concrete and steel built like a fortress. Architects have come through to see the type of construction." That quality construction also ensures quieter living, thanks to the suspended ceilings and dual wall systems that enhance soundproofing. Because Tides was built with concrete, steel and aluminum, upkeep is minimal, resulting in some of the most affordable regime fees in the area. The buildings are built to withstand storms with high winds and other weather events Mother Nature might bring our way. 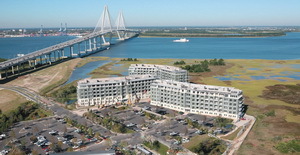 Inside the three buildings are luxurious Lowcountry condos that range from 1,240 square feet up to 3,775 square feet, boasting breathtaking views through floor-to-ceiling high-impact glass. Tide's Amentities include Pool & Summer Kitchen, Club Room and Concierge, Fitness Center and Spa, Building Lobbies and Verandas and Parking Decks and Security. In addition to the almost 80 acres of marsh front, Tides boasts "a magnificent amenities center" and easy access to Mount Pleasant's new Memorial Waterfront Park. Just steps away, the park provides green space, a play area and a little bit of history with a glorious pier that allows for long walks � and excellent fishing � over the Wando. Tides is an access-controlled community, and all activity in and out is monitored continuously. Coupled with an on-site concierge, Trenker says it is easy to feel safe. "It's so nice to lock the door and leave knowing that everything is secure and taken care of," Trenker said. When asked for the number one reason to buy at Tides, Trenker thought for a few minutes then decided there are at least 10 good reasons to live here.